Rajma Masala is a typical Punjabi style recipe that I have been trying to improvize on since years. Having tasted it at quite a few Punjabi friends homes (read school/college friends), langar at gurudwara as well as the roadside Punjabi dhabas, I try my best to replicate the same flavor at home. It never tasted the same in any of the places I tried. Each home (or dhaba or restaurant) has its own style of preparation. While the basic onion-ginger-garlic-tomato base is the same, it is the garam masala powder that makes all the difference. I have had some success with today’s recipe which is almost close to the authentic Punjabi Rajma Masala recipe. I have already blogged the recipe for Rajma Masala with Jeera Pulao and today’s version is slightly different in terms of the garam masala used. 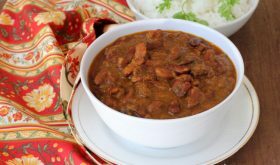 This delicious protein rich red kidney beans curry is prepared with good quality beans and care should be taken to saute the onion tomato base till rawness disappers. It is a crucial step in the making of the curry. Wash the kidney beans and soak in 4 cups waters overnight. Next day morning, pressure cook along with the same water the beans were soaked in. Cook upto 4 to 5 whitsles or cook in a large pot of water till soft. Remove half a cup of cooked beans, crush coarsely and keep aside. Heat ghee and oil in a cooking vessel. Add cumin seeds and bay leaf and allow the seeds to splutter. Add the asafoetida and stir fry for few seconds and then add the ground onion paste and saute until golden brown sprinkling water occasionally until the oil separates. Add red chilli pwd, turmeric pwd, coriander pwd, cumin pwd, kasuri methi and salt. Mix well. Add the tomato puree and cook till oil separates. Add the cooked kidney beans along with the residue water left while pressure cooking it. Cover and cook for 5 mts. Add the crushed kidney beans and some more water if required to achieve a gravy consistency. Cook for 8-10 mts without lid on medium flame after adding the water. Add garam masala and cook on simmer with lid till required gravy consistency. Turn off heat and let it sit for at least an hour for the flavors to meld. Remove to a serving bowl and garnish with chopped coriander leaves. Serve warm with steamed rice, jeera rice, chappatis or phulkas. Pinch of amchur powder can also be added for a bit of tang. If you do not have mace, omit and make garam masala with rest of the ingredients. Just before serving, garnish with a dollop of fresh cream. Its optional. By Sailu Published: June 6, 2013 Rajma Masala is one of the best Indian recipes in North Indian cuisine. 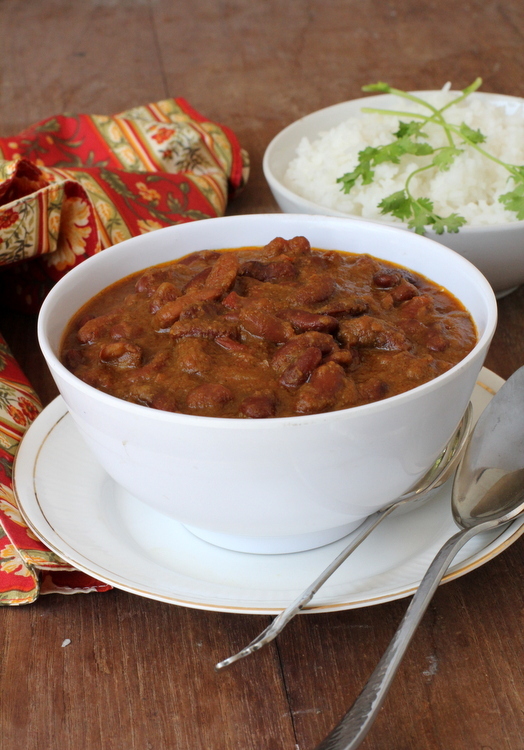 Red kidney beans curry, prepared in a spiced onion tomato base and served with rice. Looks awesome 🙂 I have one question… Onions seem to give a little bitter taste when grinded raw….Could you give any other alternative or suggestion ? The key is to saute it for a really long time till the rawness disappears. The other thing you could do is place the peeled whole onions in a pot of boiling water and blanch for 5 mts. Drain, cool and grind to a paste. Way, way too many ingredients that I cannot buy anywhere near here. You can use store bought garam masala if you find it difficult to find the spice ingredients. I totally love it with naan or roti…comfort food at its best…very well made…. Are they for jeera rice? I am a punjabi and Rajma s our absolute favt…my mom never ground the onions..cause of the bitter taste that they can give…just cut them super fine ..diced very thin..also do not fry them to the point that they get too brown..they should have a fresh taste..only slightly brown..a splash of lime to the fried onions gives the Rajma an awesome taste..
hello dear sailu! I have hardly made rajma — don’t love red kidney beans, but I love this recipe 🙂 hope you and your family are well! in the ingredients u mentioned ginger garlic paste but in the cooking process u dint mention it anywer? Add ginger garlic paste after Step 2 and saute it for 4 mts and follow rest of the procedure. Hey hi sailu.. u Hve mentioned abt ginger garlic paste but no where during ur process u hve used thm..
Add it after Step 2 and saute for 4 mts and follow rest of the procedure. What if we add khus-khus paste / coconut paste / cashew paste (or combination of all three) to the sauted onions? This will give gravy to the dish. Goutham. 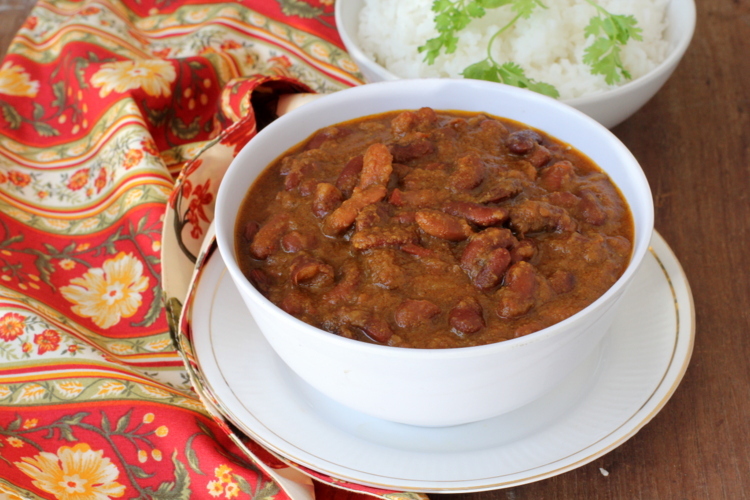 Yes, you can add to give more gravy to the dish but then it would not be the authentic Rajma Masala. I followed your recipe and made it yesterday, came out well. Thank You! ! How much cumin seeds??? Recipe does not say. Also, when do you add the garlic/ginger paste? The recipe does not say. is this recipe is a right procedure ? couz we are going to make this in our culinary..